Dicussion this morning with my daughters this morning about making shakshouka for dinner this evening. The question was “red or green’. We’re in Colorado, but the discussion sounded like we were in Santa Fe. It was an interesting morning for food discussion. We were invited to a pot luck supper last night. Mande made two kinds of cornbread, one recipe plain, one recipe with green chile. There was a debate about sugar in the cornbread. The girls have some Yankee notions about sugar in cornbread and white bread stuffing, thanks the “other” side of the family. I decided to do a Play With Your Food demo for breakfast with distinctly Southern and Tex-Mex overtones. It started with left over cornbread of both types and toasted thin slices of a baguette, a little chopped onion and celery, sweated in butter, some vegetable broth and chopped long green chile left over from yesterday’s cornbread prep. I mixed it all together in a bowl and transferred it to a baking dish. I sunk six wells into the batter and popped it into the oven for about 20 minutes. The wells were inspired by thoughts of shakshouka which a vegetable stove top casserole in which eggs are cooked. After 20 minutes my green chile cornbread stuffing was set and hot. I broke an egg into the wells and returned the dish to the oven with the goal of setting the egg whites while leaving the yolks soft and runny. I will admit I let the yolks overcook and they were not runny. 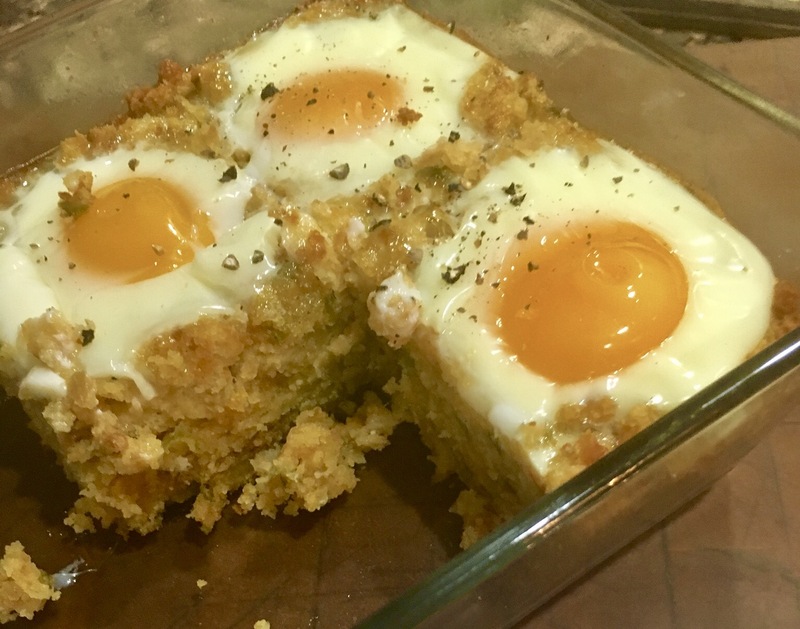 We each had two helpings of eggs in the green chile cornbread stuffing and pronounced it good. Daughter Emily came up with calling this Corn Shucka based on the eggs nestled in the corn bread. Cooking without a recipe and Playing With Your Food produces good results. Cornbread stuffing becomes Corn Shucka. A cold front blew through yesterday. The temps looked reasonable, but the wind chill was very uncomfortable. It was an evening for warming comfort food. In El Paso, we never tire of chile, red or green. I remembered making a green chile chicken pie a few weeks ago and thought it would be good to do it again. In my first attempt, I added cornmeal to a biscuit recipe to complement the chile and chicken. It was good but I thought it could use a little tweaking. baking mix and maseca – prepared cooked and dried masa for making corn tortillas, tamales and other Mexico delights. Thoroughly mix the chicken base into boiling water. Add potatoes and cut up chick thighs and simmer until cooked through – 15- 20 minutes. While potatoes and thighs are cooking, sweat onions in oil until translucent, add garlic and sweat until fragrant and soft. Add oregano and allow it to become fragrant. Remove chicken from pot and set aside to cool a little. Add onion, garlic and chile to pot with potatoes and let simmer. Adjust seasoning with salt and pepper as needed. Remember the chicken base is salty, so check before adding additional salt. When cool enough to handle, cut cooked chicken into 3/4 inch cubes and return to pot. Let ingredients simmer and the broth reduce a little. Follow baking mix instructions for biscuits. Add 3/4 cup maseca to mix and blend into dry baking mix. Add liquid per instruction and about half as much more liquid. Stir until a soft, not soggy dough forms. Turn out onto a well floured surface and knead about 10 times, pat into a half-inch thick rectangle about the size of your baking dish. My dish was too narrow for my biscuit cutter, so I used a wine glass to cut small biscuits from the dough. I got six rows of three and one-half biscuits to top the pie when it was time. I had a dozen biscuits left over, so I baked them along side the pot pie. Mix melted butter, flour and 1/2 cup milk in a two cup measure and microwave at thirty second intervals. It will thicken. Add cooking liquid from the pot and mix smooth. Microwave again. Taste and when flour mix no longer tastes raw, this mix again with pot liquid, begin to add mixture in steps back to pot and mix it well. This roux will thicken the mix in the pot. You want it fairly thick, but not gummy. 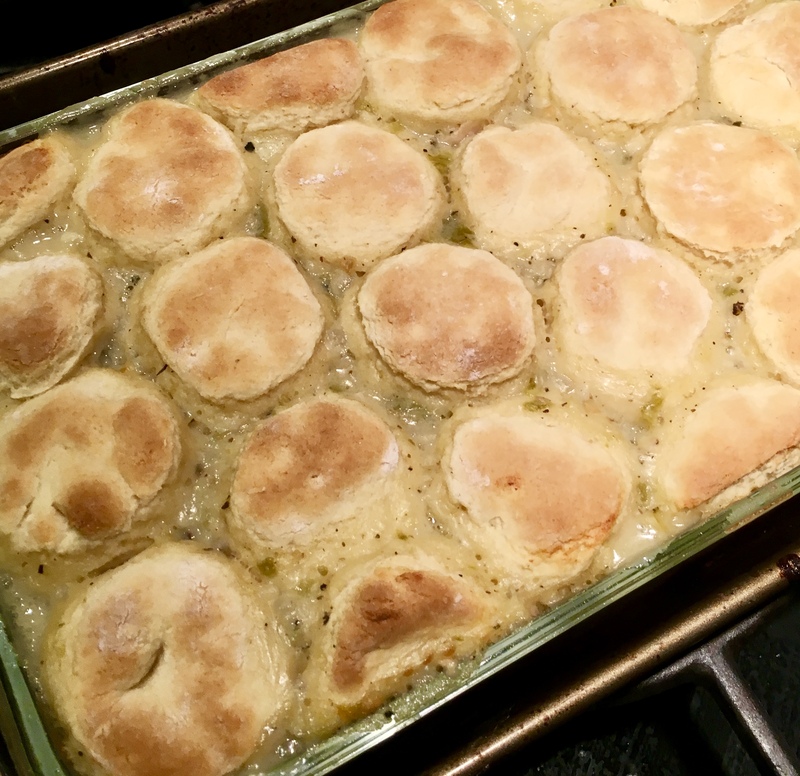 Green Chile Chicken Pot Pie with Maseca Biscuits for a cold winter night. When you don’t know what else to do, play with your food. Breakfast is always a challenge. It seems to be a conflict between healthy and sweet or savory not so healthy. Who has time to plan as far ahead as the next day’s breakfast anyway? So, here it is Sunday morning. An inventory of the kitchen: one medium potato, a couple of onions, eggs, left-over grated cheese from earlier in the week and a little bit of smoked pork belly that really should be used soon. There were a few slices of 21-grain bread and, hiding in the refrigerator, a jar with about two tablespoons of Seville Orange Marmalade. Seeing the marmalade made me imagine flamenco guitar music. And then the magic words Spanish tortilla popped into my head. 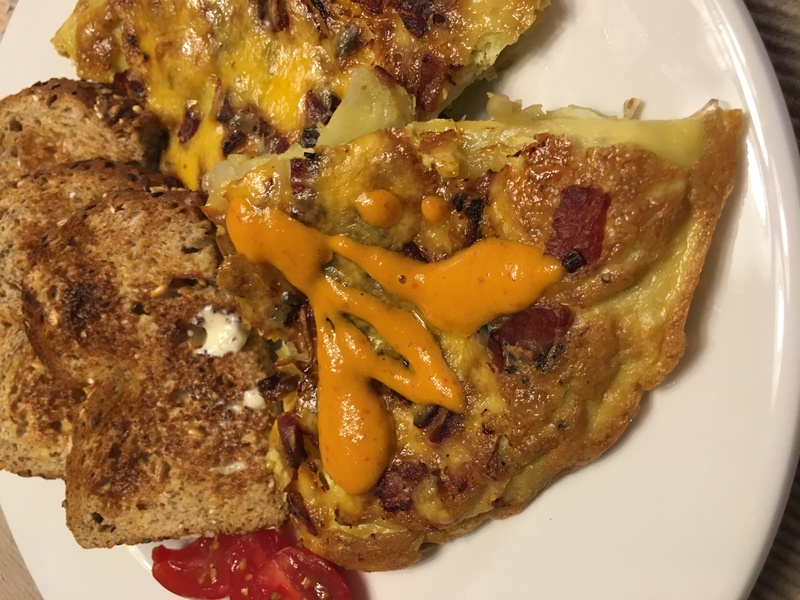 A Spanish tortilla works for breakfast and as one of a table of tapas or small plates at happy hour. The good thing is the tortilla is basically eggs and potatoes with some imagination tossed in. Since I didn’t have Spanish chorizo, a hard sausage, I decided to use my pork belly. I diced the pork belly into cubes about 1/4 inch square, then I used my hand-held mandoline to slice the potato and paper thin rings of onion. An an afterthought, I grated some extra sharp cheddar, in case there wasn’t enough fat going into the tortilla from the pork belly! I warmed the pork belly in a wide shallow sauté pan, spread it evenly and added a layer of onion slices separated into rings over the pork. Next was a layer of potato slices. I let the onions and potatoes soften for a few moments, then poured two beaten eggs and a splash of boxed egg product over everything. 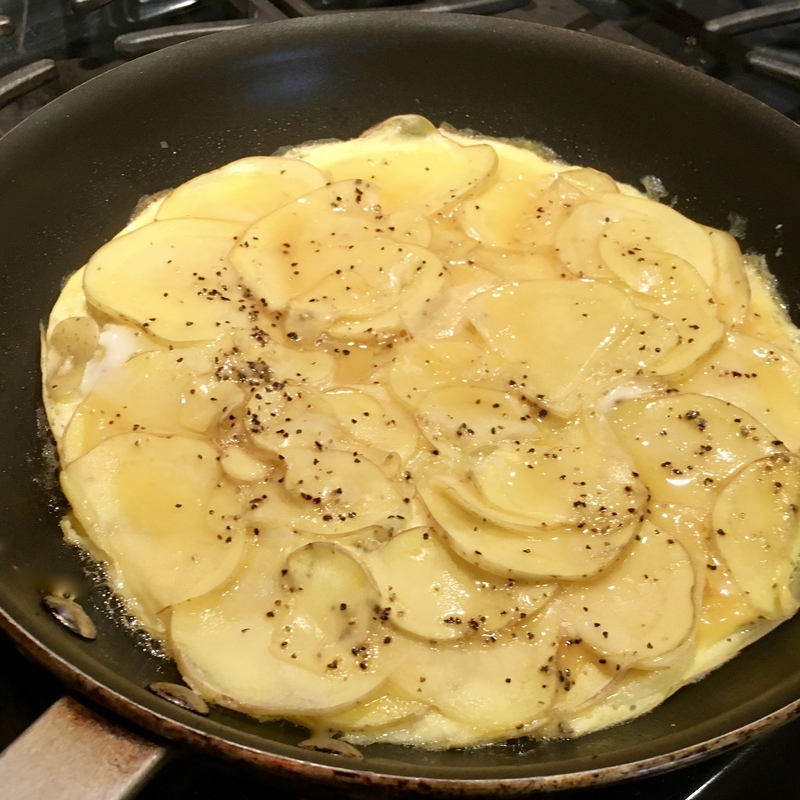 A few shakes and swirls got the egg mix down around the potato and onion slices. After the eggs began to set around the edges, I put the pan in a 375º oven for about 10 minutes. I check that the eggs were set throughout, then place a plate over the pan and flipped the tortilla out onto the plate. I slipped it back into the pan, bottom side up, sprinkled it with a little cheddar cheese and popped it back into the oven to melt. I turned the oven off while this happened and made toast. 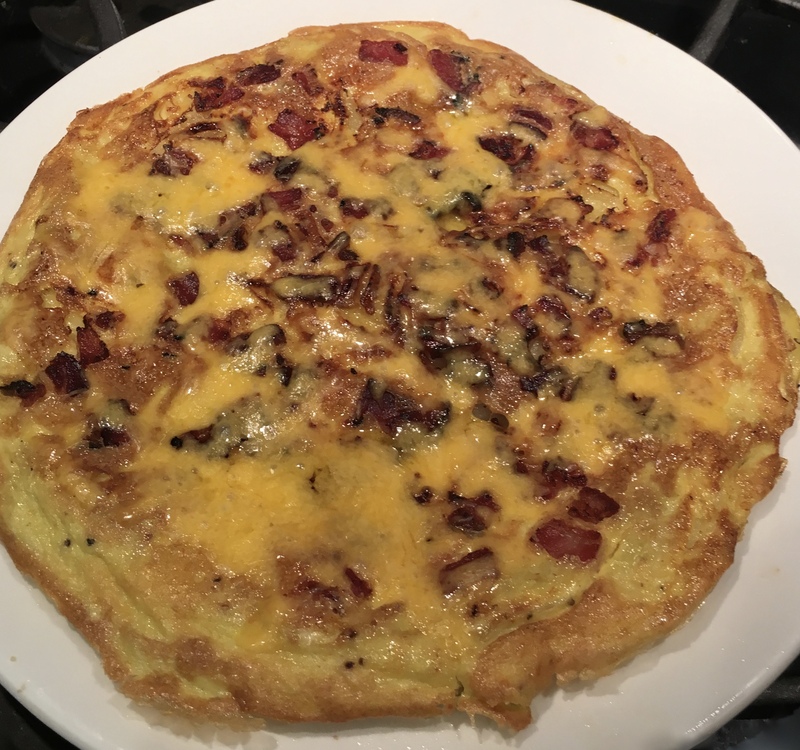 My Spanish tortilla inspired breakfast was a hit. My good neighbors gave us a wonderful homemade salsa that added a good kick to the tortilla. And, FYI, I polished off the marmalade on my toast! This is one of those play with your food and cook without a recipe meals that I’d like to make another time. Let’s hope memory and this posting kick in and make it as good a second time. Layer tortilla and eggs just beginning to set. Upside down tortilla showing meat layer now on top and melted cheese. Toast, a few grape tomatoes for color and two slices of Spanish-inspired breakfast tortilla. A wonderful salsa from my neighbor livens up the tortilla. Cold weather is here. It’s the time for comfort food to warm spirit and the body. I’ve made posole with nixtamal, a slaked corn that eventually becomes hominy. I like the firmer texture of nixtamal, but it is an acquired taste for most people. I also have made a green chile and potato soup enriched with butter and cream based on a recipe from a now defunct El Paso restaurant. And what would the winter holiday season in El Paso be without tamales? I’ve already enjoyed red pork, chicken and green chile and cheese and green chile tamales. I’d debating crashing the party when my niece and her sisters spend an afternoon making tamales. It is a lot of work and many hands make it a lot of fun. FYI, the masa used in making tamales and corn tortillas is ground nixtamal! After all these rich and comforting cold weather treats, I needed to get out a recipe I’ve made before and make a lighter version of posole. Posole is the Spanish name for what is called hominy in English. It is also the name for a stew made using hominy. There are pork and red chile posoles and chicken and green chile posoles. They are traditionally garnished with oregano and chopped onion, grated cheese and, sometimes, crunchy fried narrow strips of corn tortilla. My lighter posole uses seafood and tomatillos, serrano peppers and hominy for a very different green posole. The original recipe calls for chunks of cod. I like to add a few shrimp to the broth for color and flavor. As with anything delicious, there’s some prep involving chopping, but it is worth the effort in the end. Green posole with cod and shrimp in a tomatillo/cilantro/serrano pepper and clam juice broth garnished with cilantro and radish slices. I had extra sliced serrano for garnish, but after tasting the broth, decided it had enough kick by itself! A lighter, herbier counterpart to porky posole rojo, this tasty stew is wonderful on a crisp winter night. Heat oil in a large pot over medium. Cook shallots, garlic, and half of chiles, stirring occasionally, until soft and fragrant, 6–8 minutes. Meanwhile, purée tomatillos in a blender until smooth. Add half of tomatillo purée to pot and cook, stirring often, until thickened, about 5 minutes. Season with salt and pepper. Add 1 cup cilantro to remaining purée in blender and blend until smooth; set aside. Add cod, shrimp if using, hominy, clam juice, and 1 cup water to pot. Bring to a simmer and gently cook over medium-low until cod is opaque throughout and beginning to flake, 8–10 minutes. Remove from heat. Stir in reserved raw tomatillo-cilantro purée, breaking cod into large chunks; season with salt and pepper. Divide stew among bowls and garnish with radishes, cilantro, and remaining chile slices. Serve with lime wedges.